It’s hard to believe I’m wrapping up my 3rd pregnancy. This one has gone by FAST!! (Maybe because I’m so busy with the other two?) It has truly been a joy to carry these three sweet babies. And I LOVE being pregnant! Mindset. The mind is POWERFUL. Words have power, and our thoughts are the words we are telling ourselves. We have WAY more control over how we feel than we realize. Yes, there are some very real physical things that happen during pregnancy, but I truly believe we have the power to maximize or minimize them based on our thoughts. When we choose to approach pregnancy with a grateful heart, be genuinely thankful for the sweet blessing and the ability to carry a baby, and tell ourselves (and others) we feel great, then we can have a GREAT pregnancy. What you focus on increases. If you choose to focus on the good & get control of your mind (by reciting Scripture, singing praise music, praying with a thankful heart, & choosing to take your thoughts captive), you will feel WAY better! I really saw the power of my mindset this pregnancy. I remember feeling exhausted & having lots of pelvic pain, but when I decided to quit talking/thinking about it & start saying how great I felt, I instantly started feeling so much better. Seriously, it was night and day difference and I feel like a million bucks now! Exercise. Staying active helps me sleep better, improves my mood, helps me have more energy to keep up with the other two, & stay in *decent* shape (I say that loosely) so I can bounce back quickly after the baby. The research backing the benefits of exercise for both baby & mama is pretty incredible. It doesn’t have to be anything intense, but staying active is very important. I think lots of women live under the misconception that pregnancy means we should stop moving, but that for a normal, healthy pregnancy, that’s not true. Listen to your body. If there is anything I have learned this pregnancy, it is to listen to my body. I feel like I’m always pretty in tune with it, but I have tried to really pay attention this time around. Sometimes I need to rest or take a nap. Sometimes I need more water. Sometimes I need more of a certain food group. Sometimes I need to amp up my probiotics & vitamin C. Sometimes I need to go to the chiropractor or do specific types of stretching. Our bodies are SMART, and we need to pay attention to the signs it gives us. HYDRATE. Hydration is always crucial, but it’s even more important when you’re pregnant. If I ever don’t feel 100% on top of my game, it usually has to do with the fact that I haven’t drank enough. During early pregnancy and/or if my routine changes for some reason, I have to be intentional about drinking plenty of water. I have a pretty sweet morning routine now and I get a LOT of water in before 12 pm. Eat well. Pregnancy does not mean eating for two, nor eating tons of junk food & giving in to every craving. We are responsible for nourishing that sweet baby, and some research even indicates their taste preferences begin to form in the womb. They suggest around 300 extra calories during the second trimester, and an additional 500 calories during the third trimester. We don’t have to eat perfect, but especially need PLENTY of healthy fats, protein, & fruits and veggies. Read. I’ve always been a reader, but I like to amp up my reading while I’m pregnant. Even though I’ve been pregnant twice before, it’s nice to have a refresher about what to expect during pregnancy & labor/delivery. 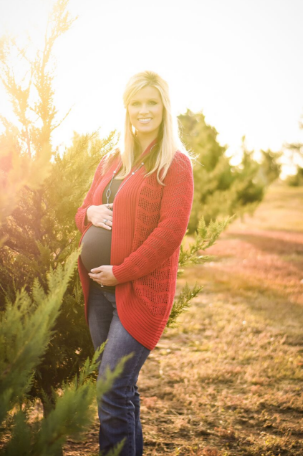 I definitely felt more confident after my first pregnancy, but I do feel like I forgot a LOT. Reading boosts my confidence, helps me focus on the right things, and I just enjoy it. Here are a few of my faves: Supernatural Childbirth, Expecting, Ina May’s Guide to Childbirth, Natural Childbirth the Bradley Way, Pregnancy 411, Praying Circles Around Your Children. Pray. If you struggle with worry/fear/anxiety…or even if you don’t…pregnancy is a VERY important time to be a diligent prayer warrior. It is not a time to allow yourself to be lazy in your prayer life. God honors the prayers we pray for our babies! Grace. Whether it’s your first or fifth pregnancy, give yourself some grace. Pregnancy is a big deal. It’s a beautiful thing, but it’s a LOT on your body. It’s not a time to compare with others or put tons of pressure on yourself.